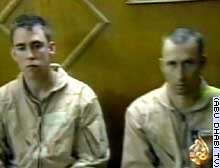 Chief Warrant Officers Ronald D. Young Jr., left, and David S. Williams were filmed after their capture. WASHINGTON (CNN) -- Pentagon officials have confirmed that two Apache helicopter pilots whose craft went down in Iraq have been taken prisoner. U.S. Apache attack helicopters had been involved in a fierce battle with units of Iraq's Republican Guard units early Monday about 100 kilometers (60 miles) south of Baghdad. The Pentagon identified the two, who were shown on video on Abu Dhabi TV, as David S. Williams of Florida and Ronald D. Young, Jr., of Georgia, both chief warrant officers. The U.S. military destroyed the helicopter later in an airstrike so the Iraqis could not gain from it, the Pentagon said. The video of the pilots, which lasted less than a minute, was shot by Iraqi TV in Baghdad and was first aired on Abu Dhabi TV. It showed the two men, separately, wearing flight suits. They were mostly talking to someone off-camera. The pilots appeared to be in good condition. The video also showed several identification and credit cards, apparently belonging to the men, including a card for a bank on a military base in the United States where Apache helicopters are based. CNN's Karl Penhaul, who was with the regiment involved in the attack, said the helicopters encountered a "heavy, heavy barrage" of anti-aircraft fire in the battle. He could not immediately say whether all of the U.S. helicopters returned safely to their base at an airfield in northern Kuwait. Most pilots said they were unable to achieve the objectives of the mission -- to hit the Republican Guard armored brigade, knock out its tanks and pierce its artillery. They spent a few hours in the air defending themselves and trying to get out of the area. The attack force did not expect such strong resistance from what they thought were mostly civilian areas, Penhaul reported. He added that pilots were "somewhat dazed, somewhat stunned" by the level of Iraqi resistance they encountered. Some of the elements the Apaches tried to strike were Iraqi T-72 battle tanks, the most advanced tank used by the Iraqi forces. The Republican Guard was estimated to have at least 90 of those tanks, along with "multiple" pieces of field artillery and armored personnel carriers, Penhaul said. The attack started after midnight (4 p.m. ET) and lasted about three hours, said Penhaul, who was aboard a Black Hawk helicopter that served as the command and control craft of a unit of Apache attack helicopters. The helicopter in which Penhaul was riding was about 25-35 kilometers (15-20 miles) from the scene of the strike. The Apache unit went up against the 2nd Armored Brigade of the Medina Division, which is part of the Republican Guard, the troops most loyal to Saddam Hussein, Penhaul said. They also attacked positions between Karbala and Hillah, which straddle the Euphrates River south of Baghdad. Penhaul is embedded with the U.S. Army's V Corps, 11th Attack Helicopter Regiment.